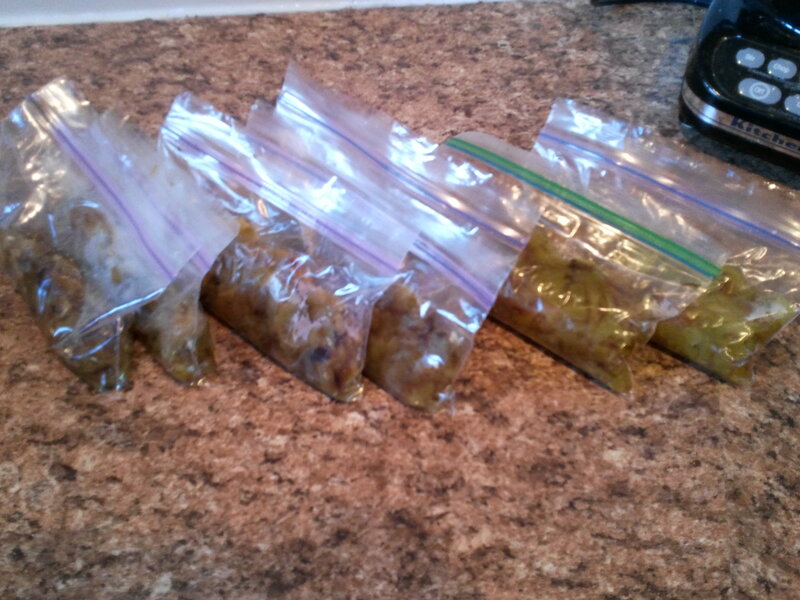 From time to time, I’ve gotten tomatillos from Bountiful Baskets Mexican packs or when they were on sale at the store. 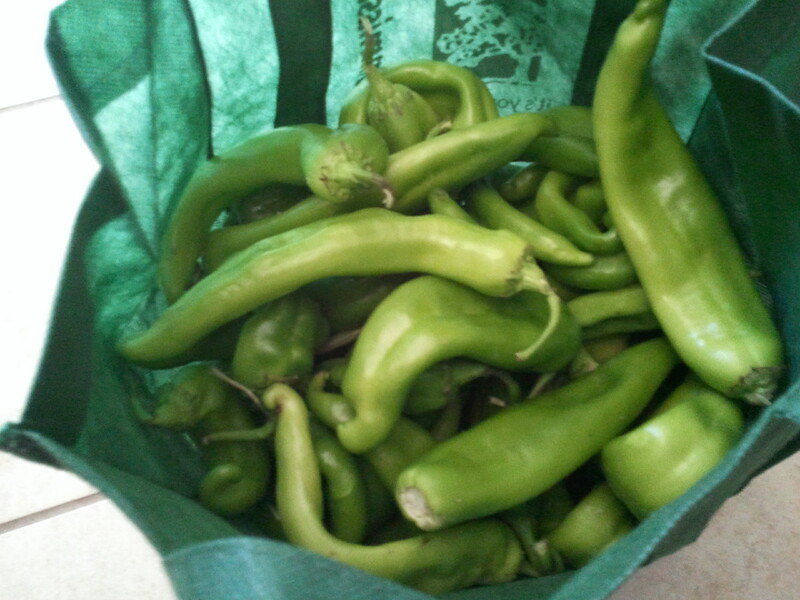 They had them available through the Sunizona FarmBox program, so I got 1 pound of them. I usually make Salsa Verde and just use it over chicken rolled in tortillas, but I always felt it was a little lacking. So, I decided to build on another enchiladas recipe I’ve made to make a creamy salsa verde sauce instead. It was perfect! I really enjoyed it, and so did the rest of my family. Preheat the oven to 350 F. Spray a 9×13 pan with non-stick cooking spray. In a medium skillet, melt the 1 Tbsp butter, and cook onions and garlic until softened. Stir in chicken, cook for a few minutes more. Remove from heat. Meanwhile, in a medium sauce pan, melt the 1/4 cup butter. Blend in flour and cook for 3-5 minutes. Whisk in the Salsa Verde and chicken broth, making sure there are no lumps. Cook, stirring, until sauce boils and thickens. Remove from heat. 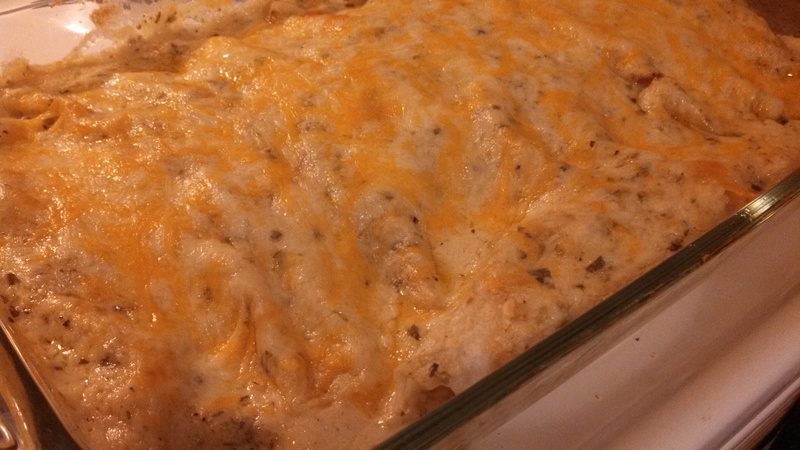 Stir in sour cream and ½ cup cheese. Then, stir ½ cup of the sauce into the chicken and onion mixture. Heat a small skillet over medium low heat. 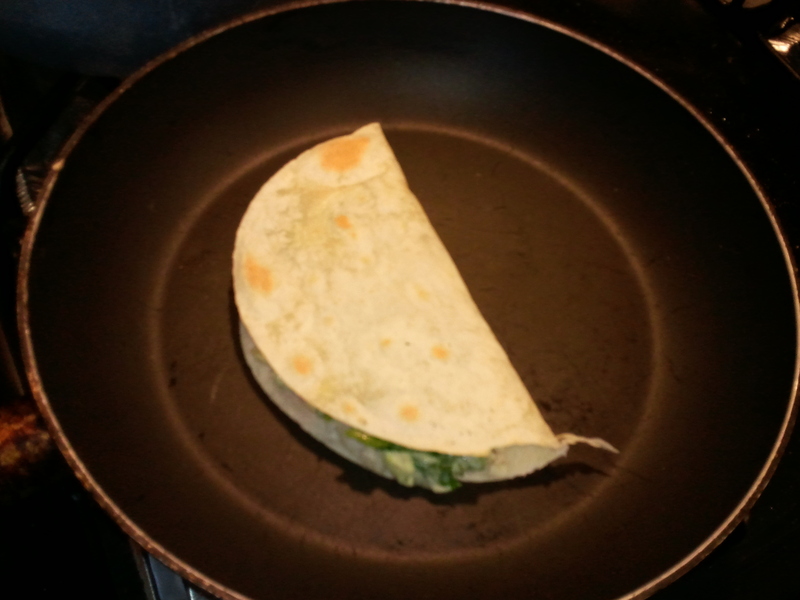 Place a tortilla in skillet and heat on each side for a few seconds to make tortilla easier to roll. 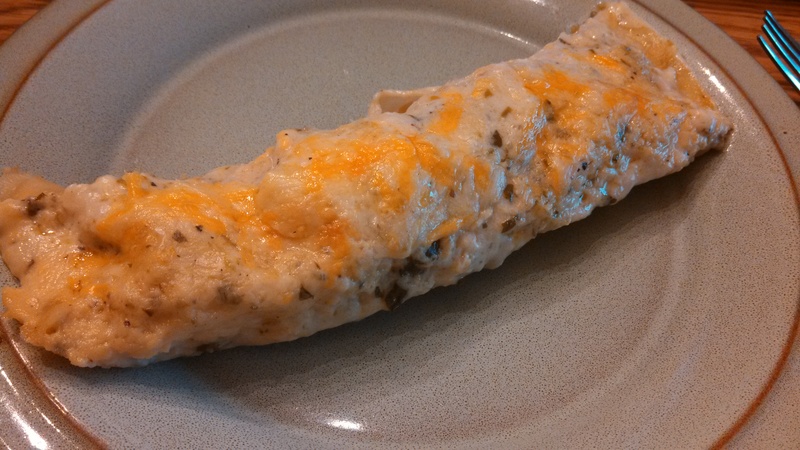 Spoon the chicken mixture onto one end of the tortilla and roll up. Place in 9×13 pan. Repeat for remaining tortillas. 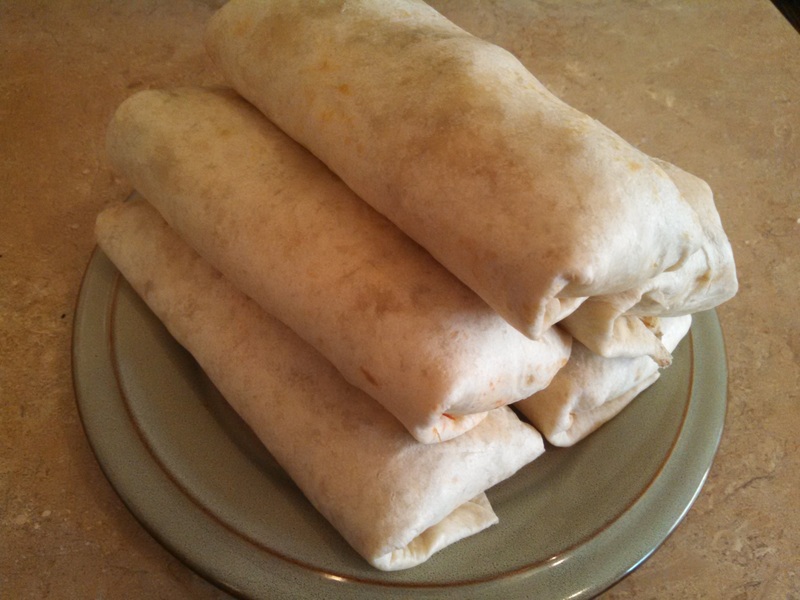 Pour remaining sauce over the rolled tortillas, and sprinkle with the remaining 1 cup of cheese. We are still working on all the leftover turkey here! My husband had wanted enchiladas, which I didn’t have enough time to get together, so we had quesadillas instead. To start, I put 2 cups chopped turkey and 2 cups salsa in a skillet over medium-low heat and cooked about 15 minutes to let the salsa set in to the turkey. 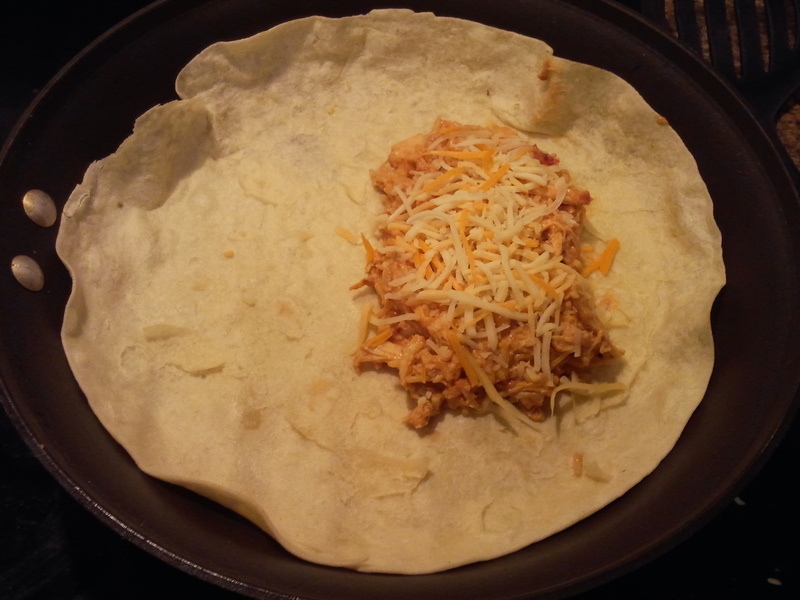 Then, in a different skillet, I put a tortilla (these are the small flour tortillas from Bountiful Baskets), then some of the chicken and salsa mixture, then shredded Mexican blend cheese, and folded the tortilla over. 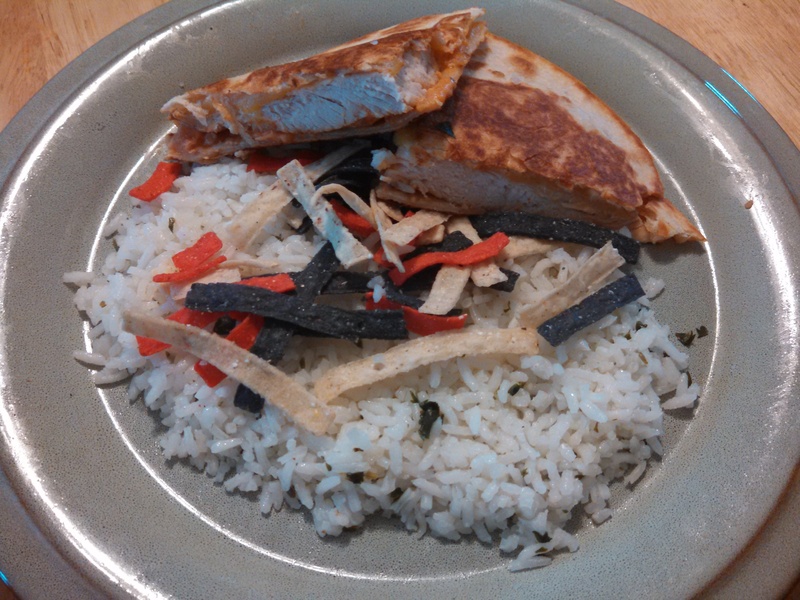 I cooked for a few minutes on each side until the tortilla browned. I then served with sour cream and homemade guacamole. It was a big hit in my house! 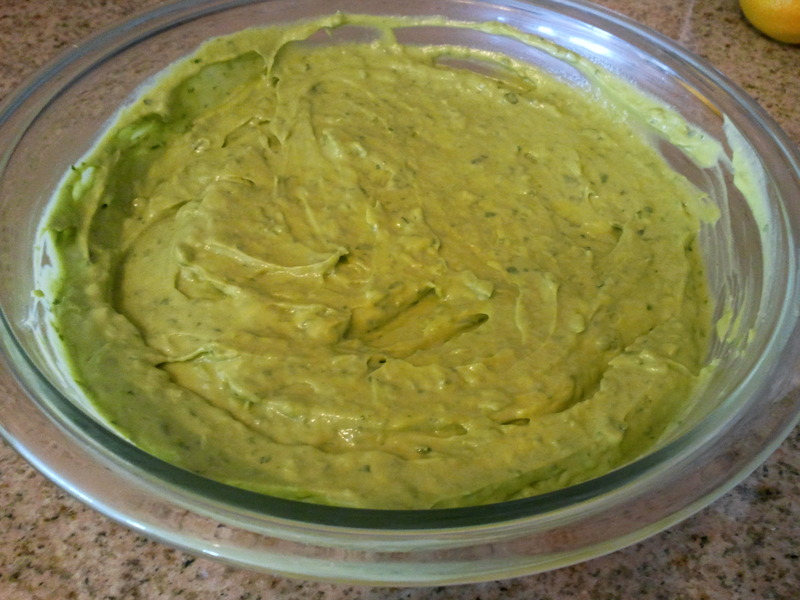 This afternoon, I finally got around to making Guacamole using all the ingredients from my guacamole pack. The avocados were beautiful, and the guacamole turned out amazing! I ended up with about 5 cups of guacamole. 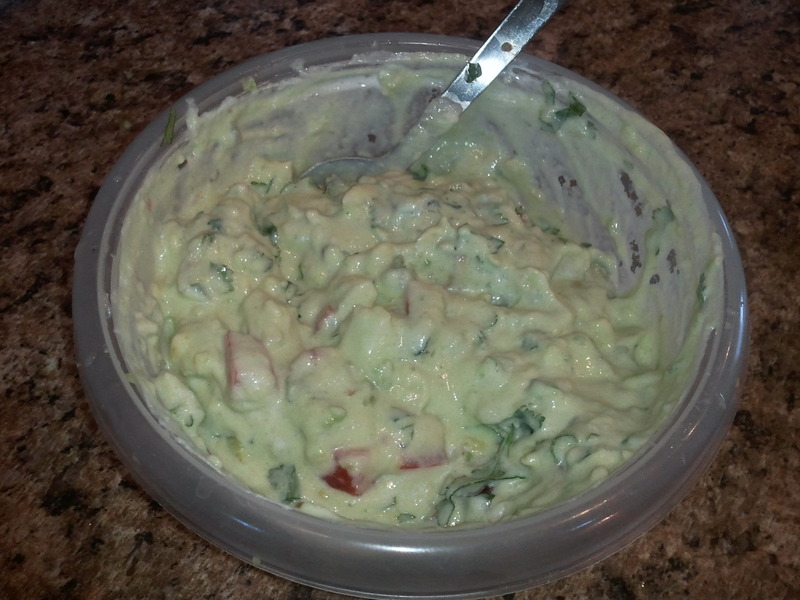 So, I needed to find a use for some of the guacamole, besides just eating it. 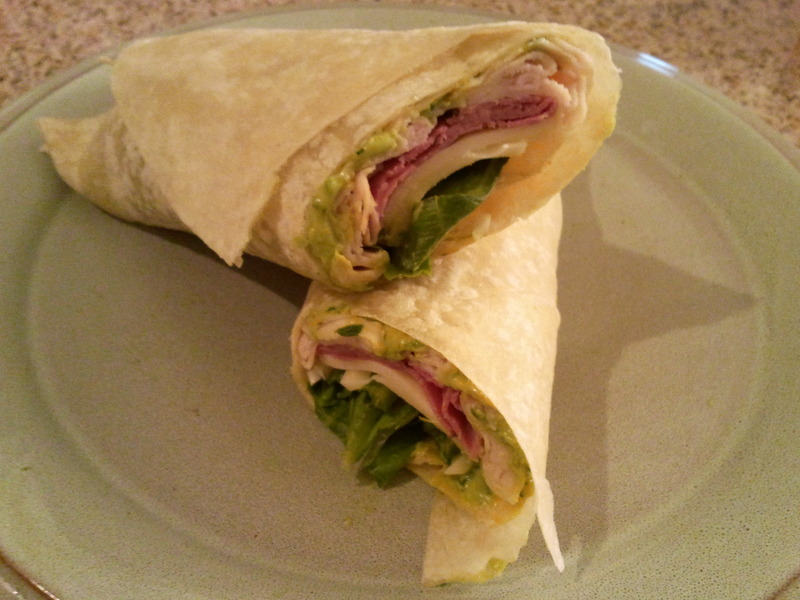 I ended up not having a lot of time for dinner prep tonight, so I decided to make some wraps. I had recently gotten some large flour tortillas out of the freezer, so they were thawed and ready to go. I briefly heated up each side of the tortilla, spread some guacamole at one end, laid down turkey and roast beef deli meat, then some sliced swiss cheese, and some lettuce. 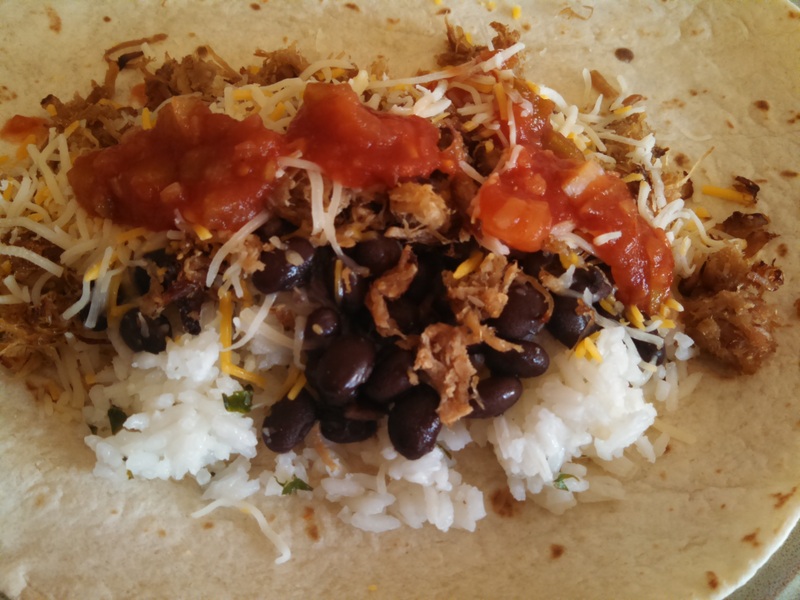 I rolled it up, cut it in half, and had a very delicious dinner that my husband and kids were very pleased with! 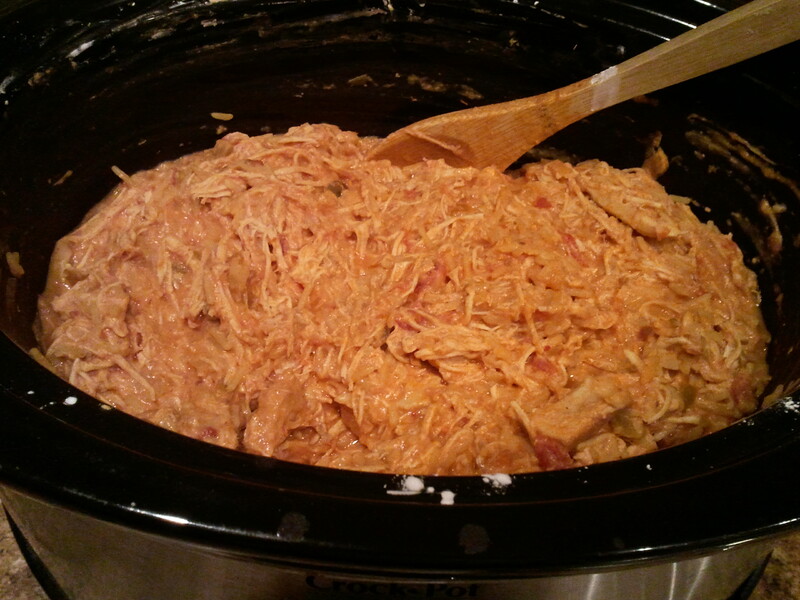 This is a great recipe I got from Lori over at My Kinda Rain. Since I get tortillas and the Mexican themed veggie pack regularly from Bountiful Baskets, this has become a regular in our house when avocados are available and cheap. I have played around with this recipe a bit, I don’t think I’ve made it the same way twice, but every time it has turned out great. So, I will go through the recipe and talk about some of the alternatives I have done. This time, I used all of the above when making the sauce because I had cilantro and tomato on hand that needed to be used before it went bad. Next, you cook the fish. 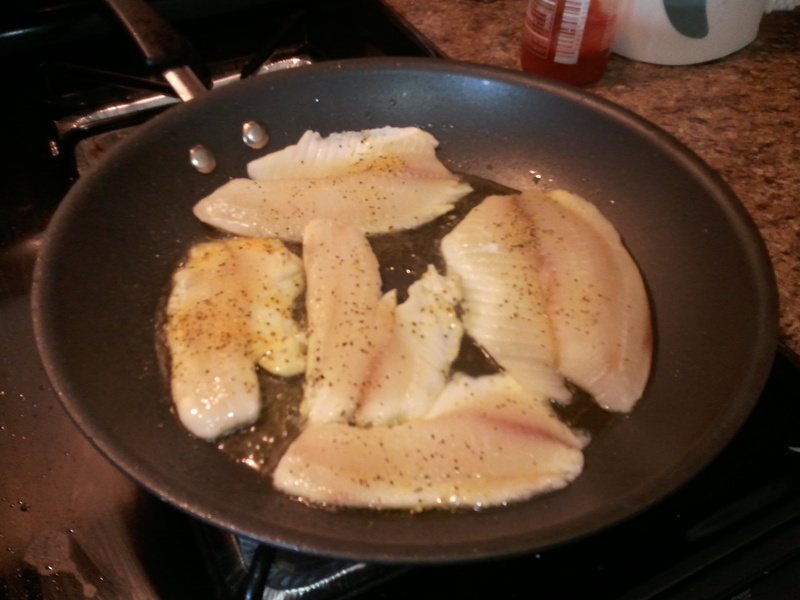 You need 1 lb of white fish, I use either cod or tilapia, depending on what I can get on sale. You add 1-2 Tbsp of oil, I use olive oil, to a skillet. Season the fish with lemon pepper seasoning and pan fry fish. Cook until fish is no longer translucent and easily flakes with a fork. Flake fish apart with a fork. Next, you put together the tacos. I usually use small flour tortillas, but have used small corn tortillas as well. 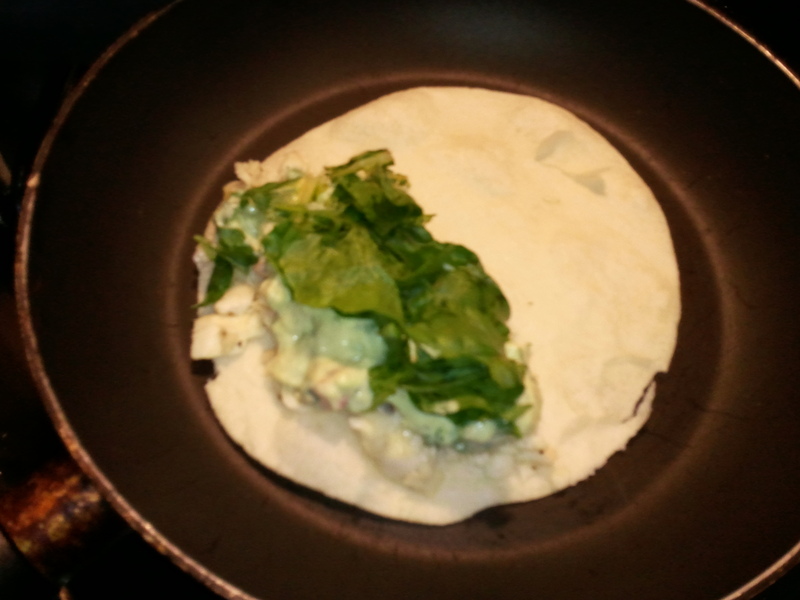 I add a tortilla to a small skillet, then put the fish, avocado cream sauce, and cabbage or lettuce. 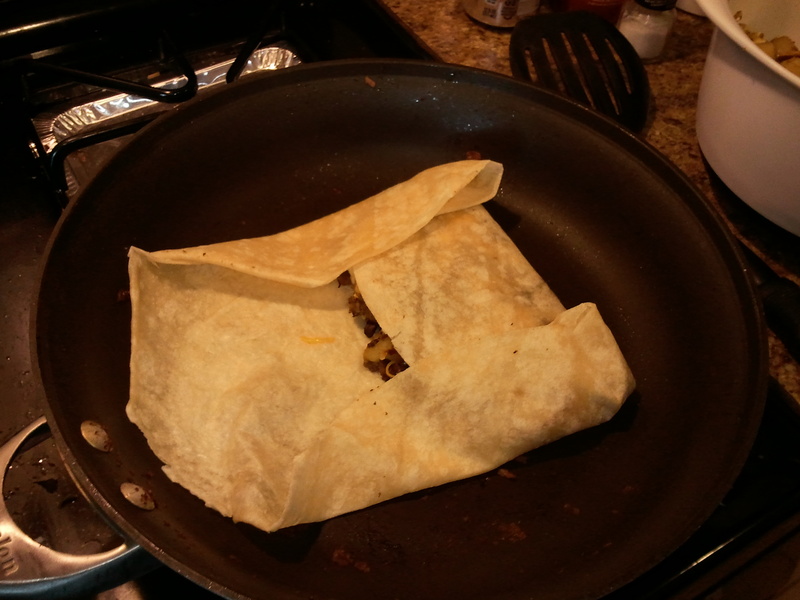 I fold the tortilla over the topping, cook it for a few minutes, then flip and cook for a few minutes, until both sides are just starting to brown. I usually serve this with Spanish rice and black beans. I was worried that my girls wouldn’t eat these because it has fish, but they both eat these up! 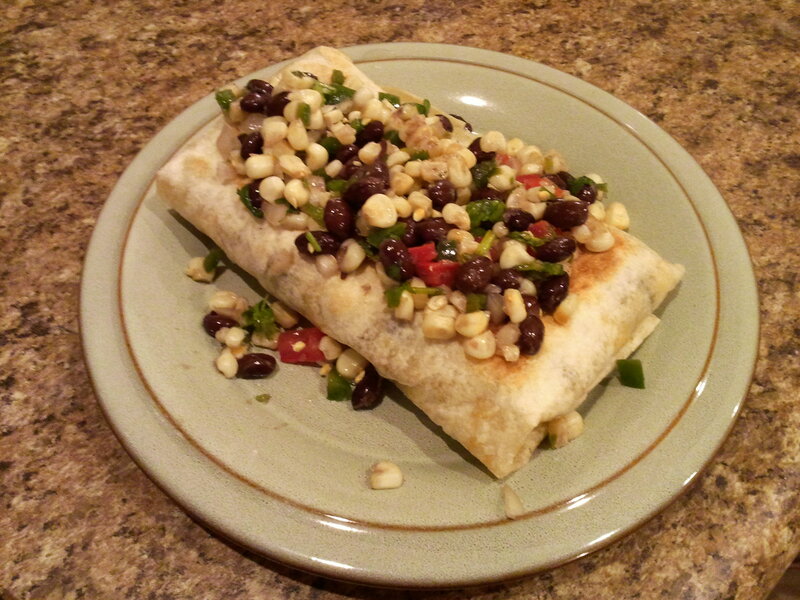 For last night’s dinner, I decided that I would make burritos. I had large flour tortillas in my freezer from 8/27 Bountiful Baskets. I also had steak leftover from a couple of nights ago, plus the roasted corn salsa I made. 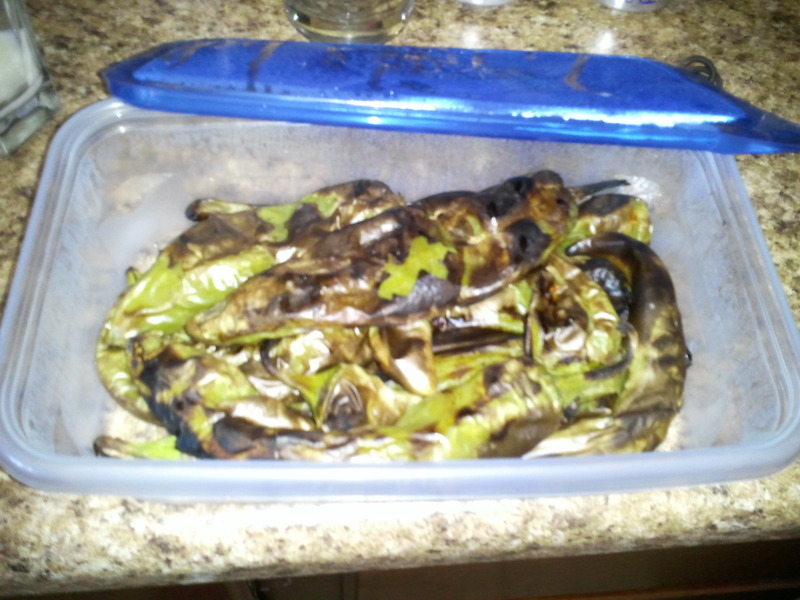 I had roasted Poblano peppers on the grill last week that had been in my 8/27 Bountiful Baskets Mexican pack. And, we need to work through the 15 pounds of potatoes we still have. First, my brother-in-law helped by washing, peeling, and dicing the potatoes, about 2 pounds of russets. I put some olive oil in a large skillet and started cooking half of the potatoes. 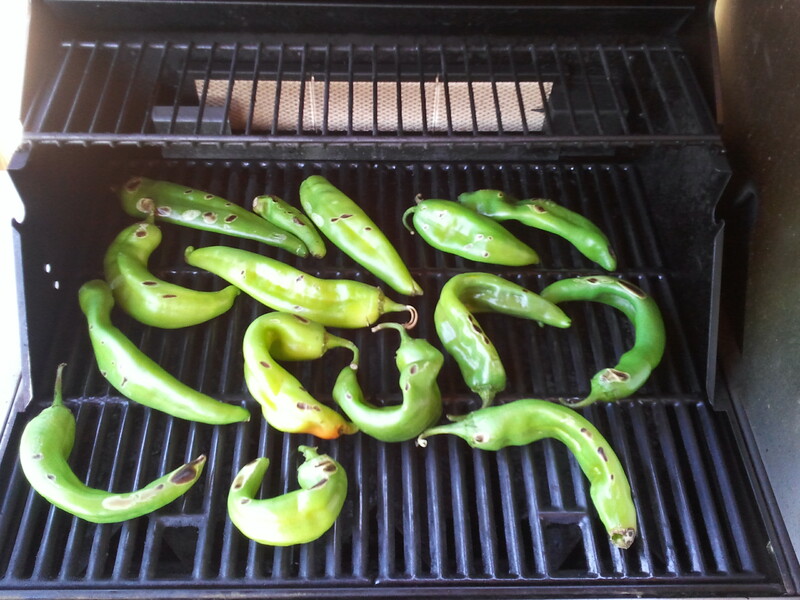 After cooking for a few minutes, I added some diced onion and the Poblano pepper. 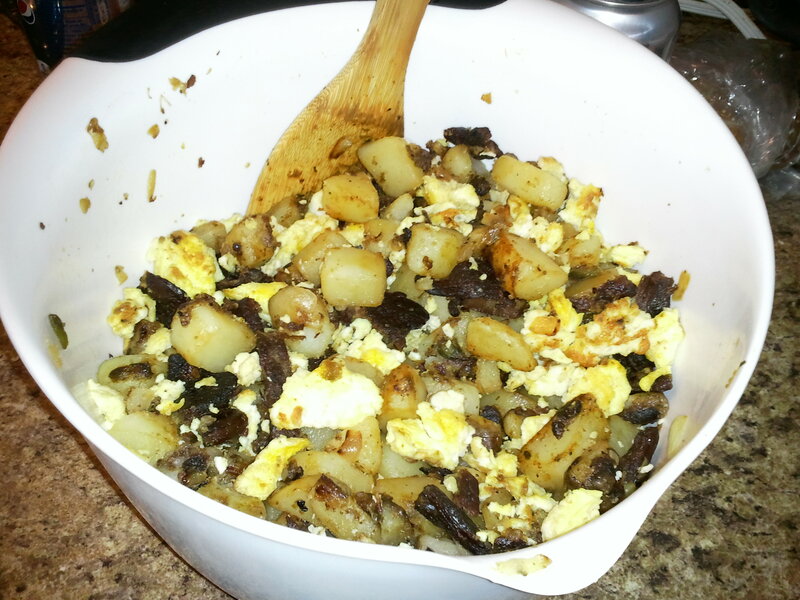 I cooked until the potatoes started to soften and brown, then added in the cut pieces of steak. 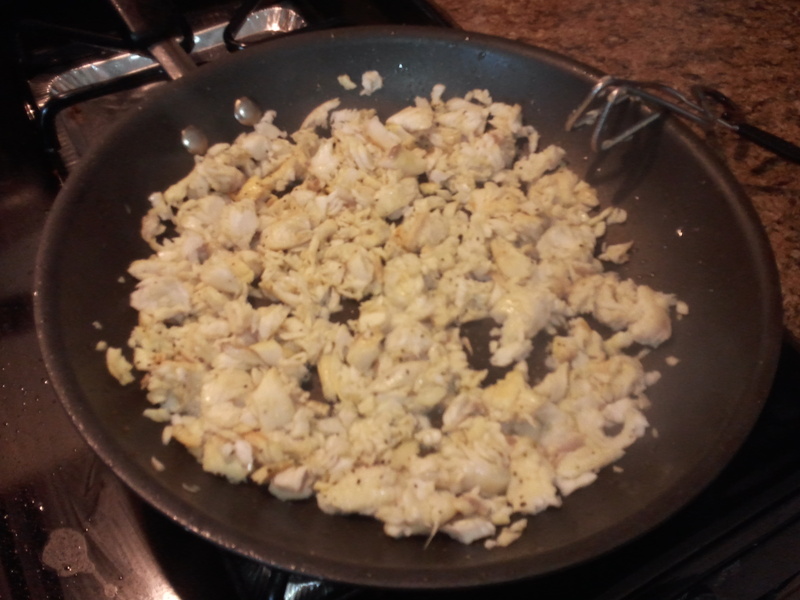 Meanwhile, in a separate skillet, I scrambled 6 eggs. I mixed this all together in a bowl and started the process again to use up the other half of the potatoes. I had to do it in 2 parts because my pans weren’t big enough for all of it at once. 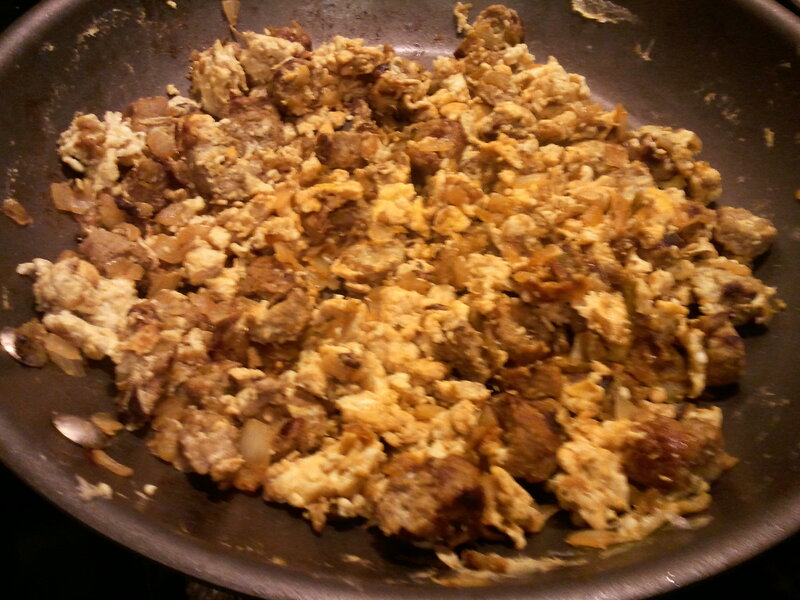 Once the filling was complete, I cleaned the large skillet and added it to medium-low heat. I placed a tortilla in the pan, added some of the filling toward one side of the tortilla, and sprinkled on Mexican blend cheese. 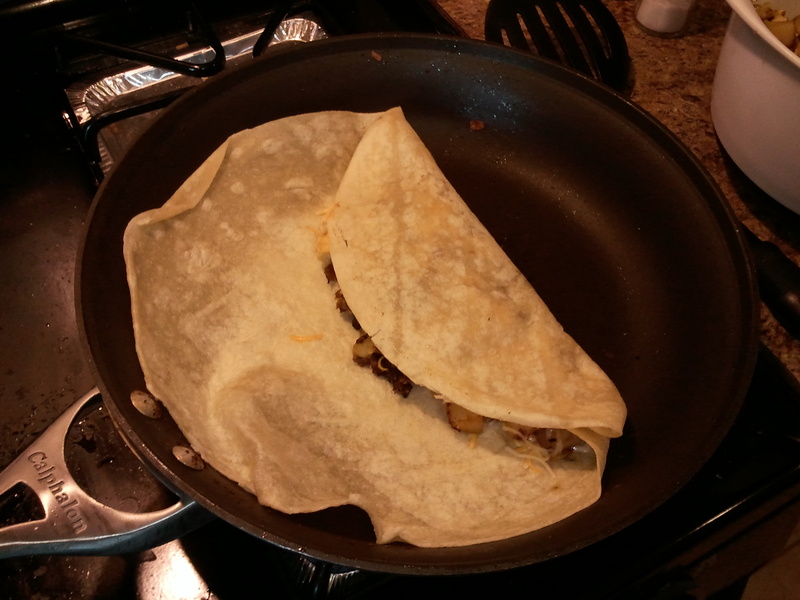 Fold over the side of the tortilla closest to the filling over the filling. 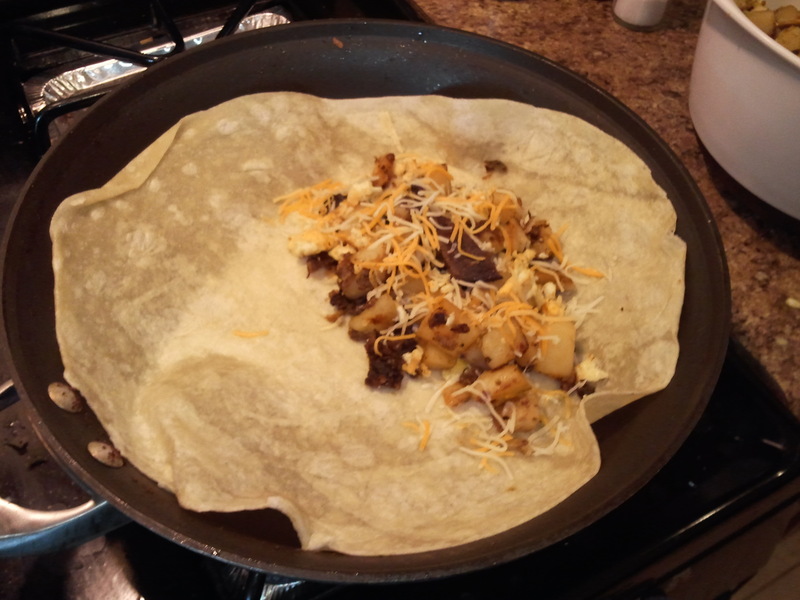 Next, fold over the top and bottom of the tortilla. 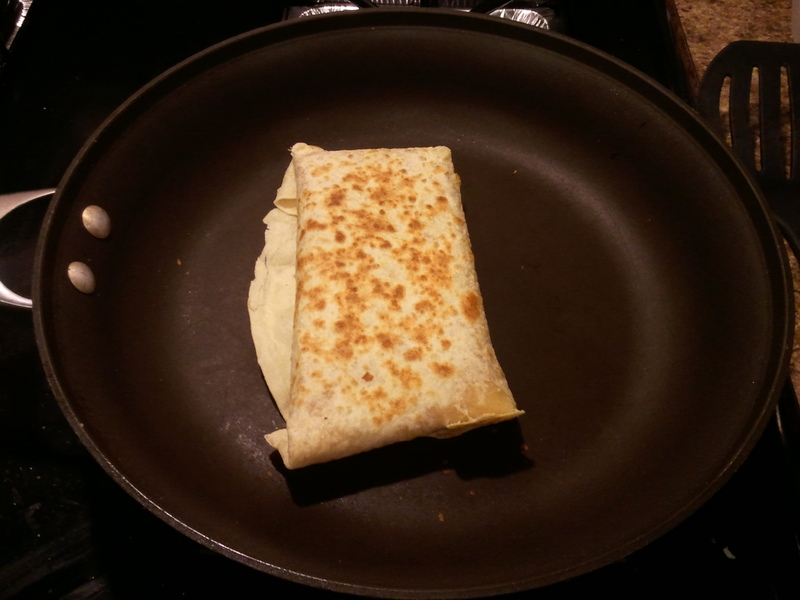 Finally, fold the section with the filling over to complete the burrito. 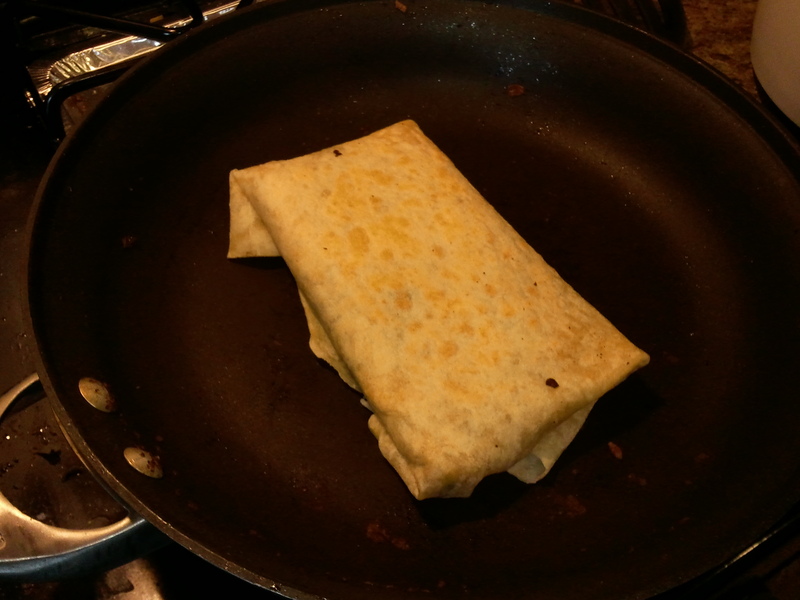 Brown on that side for a few minutes, then flip the burrito over and brown on the other side for a few minutes. Remove from pan and serve. I served mine with roasted corn salsa over it. Yum! Since I get 3 dozen of the large tortillas in the tortilla pack from Bountiful Baskets, I’m always playing around with fillings for burritos.